This review that originally appeared in Critics at Large is reproduced on this site because it reviews a book that illustrates the courage shown by a family in Occupied France a "space of blue" in a dark time. 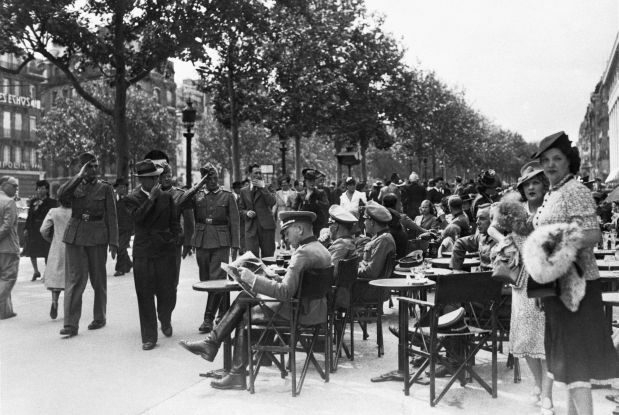 German officers at a sidewalk café on the Champs-Élysées in July 1940, one month after the Nazi invasion of France. – Anthony Eden, former British Prime Minister, from The Sorrow and the Pity. French television refused to air Marcel Ophuls’ landmark 4 1/2-hour documentary, The Sorrow and the Pity(1969); its 1971 cinematic release punctured a powerful myth promoted after the war by Charles De Gaulle: that the French nation by and large heroically resisted the Germans during the four-year occupation. Ophuls makes it clear that the majority of Frenchmen were neither supporters of the Germans nor members of the resistance. Rather, they went along quietly with the wartime collaborationist government of Marshal Pétain. Regardless of how they behaved, for a variety of reasons, the vast majority of French citizens opted for remaining silent, even those who acted heroically. In his prologue to The Cost of Courage (Other Press, 2015), Charles Kaiser, a former reporter turned author, describes how he first encountered that strange silence when he met the French family that had lodged his uncle, a GI named Henry Kaiser, in Paris during the last year of the war. From his uncle, Charles heard stories of their heroism: “The most dramatic movie about the war,” the nephew writes, “was the one I learned by heart but had seen only in my head.” Yet when he finally met the surviving members of the Boulloche family as a child in the early 1960s, they were reticent about their war experiences: “It would take me five decades, including two and a half years living in France, to unravel the reasons for the heroes’ silence.” It is the author’s connection with this cultured, upper-middle-class Catholic family, particularly with the daughter, Christiane, that gives The Cost of Courage its distinctive resonance. Only after the death of her siblings is Christiane willing to share with Kaiser the family’s harrowing experiences during the Occupation. Assisted by declassified British documents, letters, diaries and conversations with the children of the next generation, the author narrates a powerful account of one family’s courage, guilt and pain. 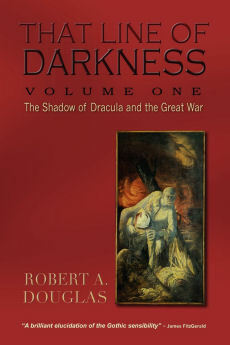 He supplements their story with the larger historical context of the war. 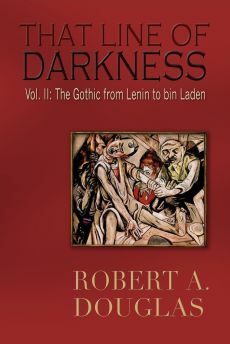 Initially, this device appears jarring, juxtaposing a thriller-like narrative written in the present tense with a more conventional historical overview. But as we become accustomed to it, it begins to work, especially when he is able to weave the two threads together with the onset of the Allied invasion of Normandy. Kaiser’s moving account opens with André Boulloche’s 1944 arrest by the Gestapo after he was betrayed by one of his Resistance coterie during torture. With a German pistol at his back, the young resistance fighter is forced to approach the secret site and use the coded knock that will prompt André to open the door and be shot in the stomach as he attempts to escape. After that dramatic beginning, Kaiser pivots to limning André’s journey from highway engineer to secret agent. Believing that dignity is incompatible with submission, André joins the Resistance in 1940 without any hesitation. He observes German troop movements, obtains enemy building plans and writes communiqués in lemon juice, which becomes legible when heated. In late 1942, he is sent to England, debriefed, then under Charles de Gaulle, leader of the ragtag Free French forces, is parachuted into France with 500,000 francs to fund the fight against the Germans. Two other Boulloche siblings – Christiane and Jacqueline – also join the Resistance, smuggling arms, gathering information, sabotaging missions and setting up safe houses and, when necessary, closing them down after one of their members was arrested. Kaiser focuses primarily on André and Christiane; Jacqueline is a more shadowy figure in this family drama. Their parents and older brother Robert were not members of the Resistance but, because of the family association, they were not immune from Nazi retaliation. Through diligent research, Kaiser is able to provide us with a detailed account of André’s, capture, interrogation and his train journey to Auschwitz. He was among the 1,700 French prisoners who were crammed into seventeen cattle cars, “one of only three trains of non-Jews to be sent there from France during the entire war.” Fortunately, the Gestapo was never able to identify André’s real name, sparing him the fate of others who were taken off the train and executed on the spot. In Auschwitz and two other camps, according to a fellow resistor, his dignity and steadfast bearing "surely saved the lives of a number of his companions." Christiane’s life was equally fraught with risk. She would ride her bike about sixty miles a day Women were searched less frequently than men at Nazi checkpoints, so Christiane and other women in the Resistance would often transport guns and radio parts by stashing them beneath a heap of fresh vegetables in a bicycle basket. 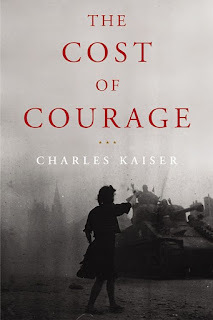 Kaiser’s account is a powerful reminder of the extent that luck played in surviving the war as a member of the Resistance. I counted at least three occasions that Christiane was able by sheer good fortune to escape arrest. On one of them, Christiane’s life was likely spared because she got a flat tire while riding her bicycle to an infiltrated safe house, allowing someone to intercept and warn her. Although some family members survived this ordeal, not all did. Kaiser suggests that no other non-Jewish family in France paid such a high price for their courage. The Boulloche family’s subsequent welter of emotions likely accounts for the years of silence, apart from a brief annual commemoration. Kaiser is hoping that his American readers, who know little or minimize the role of the French Resistance, will come to appreciate its efforts in contributing to the Allied victory. Throughout the war, it intercepted vital information on German troop movements, conducted sabotage operations that targeted military infrastructure, and partnered with British spies, as for example fictionalized in Simon Mawer’s The Girl that Fell from the Sky, to relay intelligence back to Churchill and de Gaulle in London. In the days and weeks preceding the Allied assault on Normandy, members of the Resistance effectively destroyed huge stretches of rail lines that would have otherwise allowed the Nazis to rush reinforcements to the Normandy front, a contribution that Eisenhower acknowledges in his memoirs. Without the Resistance support, Eisenhower might not have yielded to de Gaulle’s request to liberate Paris first before ordering Allied troops to Germany. A scene from Un village français, which premiered on French television in 2009. 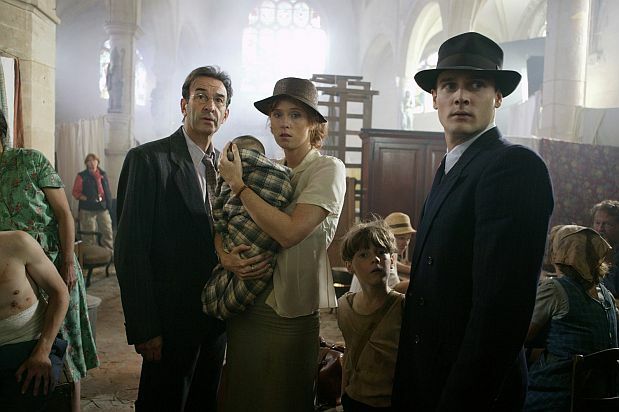 If The Cost of Courage focuses on one family’s courage and sacrifices, the 2009 French television dramatic series, Un village français, similar to The Sorrow and the Pity, employs a broader lens to explore the myriad roles of the French and the Germans during the war. The award-winning series is the first major French dramatic production to address the collaboration during the Nazi occupation. The drama begins with the arrival of German troops in June 1940 in Villeneuve, a fictional village in the Jura Mountains. The recognition that the French have lost the war is beginning to sink in. The series offers a nuanced, historically authentic but not unsympathetic look at ordinary people suddenly confronted by defeat and enemy occupation. Based on the evidence of the first twelve episodes, it is not its originality that startles – Un village plows familiar terrain – but what is so refreshing is that the script does not indict or exonerate the characters. Without the advantage of historical hindsight, the series tracks the lives of people who are forced to make decisions that often have major consequences for themselves or for other people. It vividly dramatizes the narrow line between collaboration and survival, and between courage and acquiescence. In this character-driven series with its wonderful ensemble cast, it takes several episodes for their roles to begin to evolve in response to the Occupation. Our early perceptions about who might represent the moral compass of the villagers often turn out to be wrong. Apart from one German Commandant who is a member of the dreaded SD (the intelligence division of the Gestapo), there are no egregious villains, even among the Germans. Instead, it depicts a kaleidoscopic adjustment as relations between people, both French and Germans, are constantly shifting. Some of the characters find their innate loyalties challenged and can surprise us by their responses. In the first episode, the compassionate village doctor is pressured into taking over as mayor and soon discovers the inevitability of compromise with the enemy, and yet…. The mayor’s brother, Marcel, is a Communist who arouses the suspicion of the Germans and the ideologically-straitjacketed local party bosses because of his cooperation with a Gaullist sympathizer. A local businessman agrees to provide services to the Germans so he can freely cross checkpoints between the Occupied Zone and the “Free Zone” of Vichy France to visit his mistress. Yet this ostensibly apolitical manager of a lumber mill reveals his humanity by exercising his influence to assist a Jewish woman. Perhaps one of the biggest surprises is the changing role of his mistress. Even when another individual betrays a trust that leads to at least two deaths, he does so not for ideological, nationalistic or even mercenary reasons, but out of a sense of rage at a personal betrayal. Everywhere, the situation is both fluid and murky. Based on the first twelve episodes that are now available in North America, I can only reinforce the wise words spoken by Eden quoted in the opening epigraph. The series has five seasons of sixty programs; I certainly hope that its entirety will soon be available because I would suggest that Un village français is television at its best.